Take the existing sqldiff scripts and migrate them to liquibase. Make sure the liquibase scripts work on postgres. 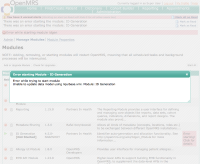 Upgrade OpenMRS minimum version dependency to 1.6.6 for liquibase support.